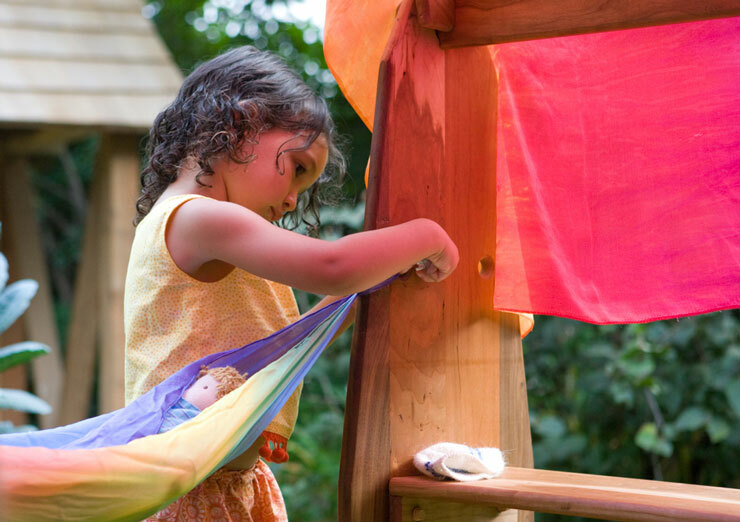 If you’ve ever considered exploring Waldorf education, whether as an option for formal schooling, homeschooling or simply a way to create a particular type of home environment, you have very likely read a lot about playstands. 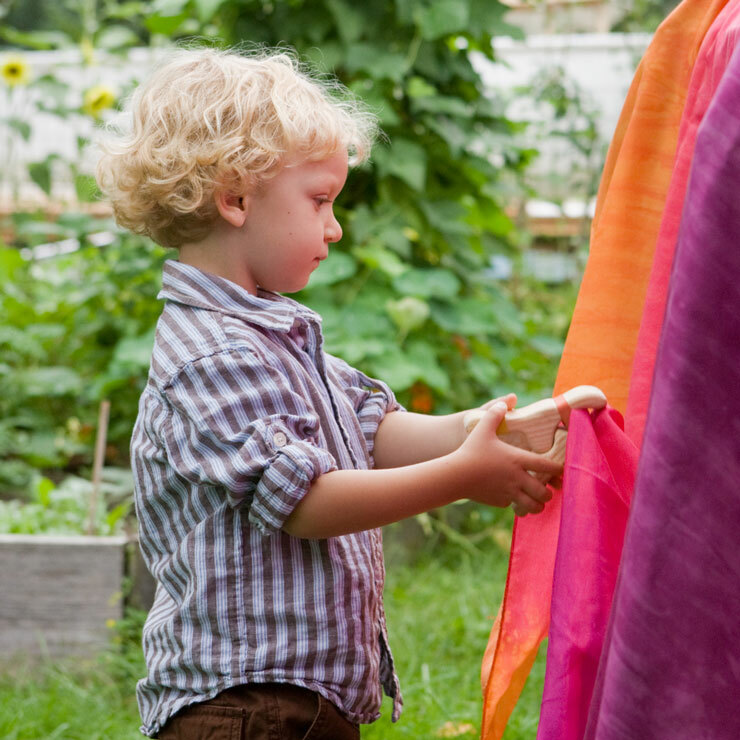 If you’ve visited a Waldorf School, you’ve noted that they are a fixture in virtually every Waldorf kindergarten classroom. Perhaps you’ve wondered if they’re really all that important, given that they are rather bulky and may seem expensive. Will you be able to justify the expense? I’d suggest that you will discover, as many parents have, that incorporating them into your children’s play space is well worth the investment. What is it that makes playstands special? At a glance, they might seem to simply be a curvy bookshelf without a back. Looks can be deceiving, however. First and most important, they are extremely open-ended. While you might often see them used in sets of two with a colorful silk or other canopy in the classroom environment, with even just one playstand, your child can make car ramps, a store shelf, a coffee shop, a doll bed, a kitchen counter or a fort. Outfitted with a scale, a cash register, a collection of play silks or pots and pans, the unadorned, unformed nature of the shelves invites the child’s imagination to blossom. 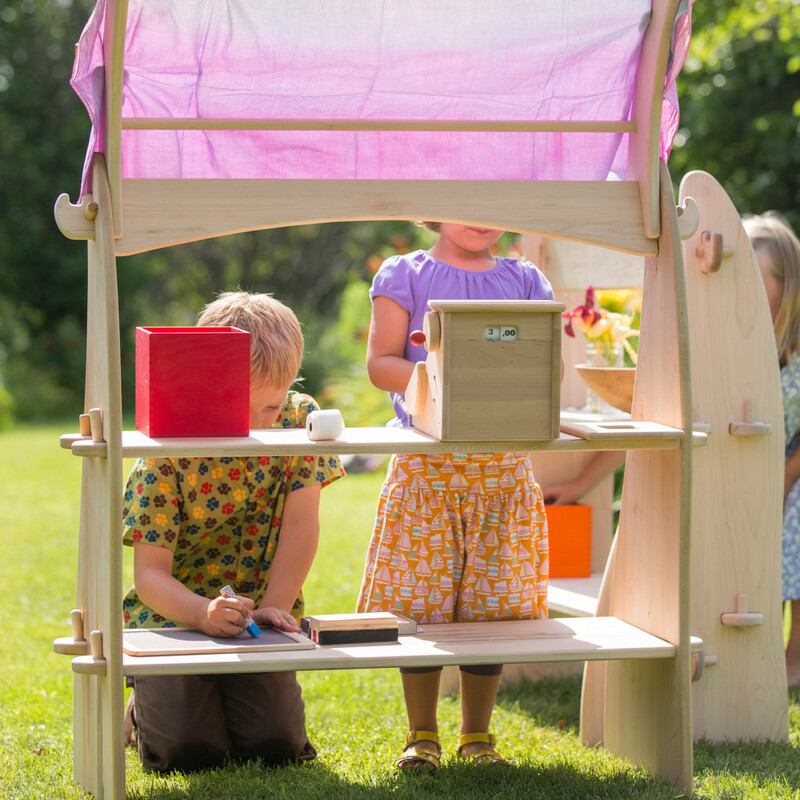 If your space or budget allows, children can use two playstands with a canopy to form imaginary homes or simply cozy, quiet places. Using the floor space created between the two playstands, children use wooden blocks and other toys to extend their play to whole villages and other constructed scenes they can inhabit. The play value of such a toy can not be underestimated; toys that allow this freedom give your children a chance to follow their own imaginations without being hampered by the proscriptive forms of their playthings. Second, they are lightweight enough for your child to move about. The sense of self-determination a child obtains in being able to form their own space can be quite empowering. These pieces of furniture that adults designate as “toys” give your child the freedom to create the world they want to be in for this moment. Because they can move them around easily, they can carry them outside or incorporate other furniture or walls into their imagined world. Also, they can use play clips to fasten thin fabrics, like silk or muslin, to the dowels or arches to make a house. Our children made dens by fastening fabric to the lower shelves. Third, they are sized for children. The shelves and cross pieces are at a height that is useful to children. They can stand or sit at the shelves and have a handy work surface that is convenient for them. Whether they’re changing their dolls’ clothes, fastening sails to their ships or repairing a roof, everything is within reach. Finally, they make a great place to tuck away playthings when the day is done. Set against a wall with toys arranged quietly on the shelves not only means the end of one day, but offers a promise of new adventures in the day to come.